Inositol is a vitamin-like substance. It is found in many plants and animals. It can also be made in a laboratory. Inositol is used for diabetic nerve pain, panic disorder, high cholesterol, insomnia, cancer, depression, schizophrenia, Alzheimer’s disease, attention deficit-hyperactivity disorder (ADHD), autism, promoting HAIR GROWTH, a skin disorder called psoriasis, and treating side effects of medical treatment with lithium. 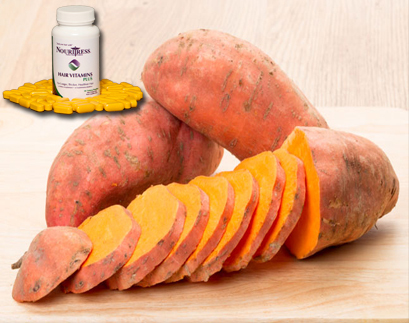 Inositol is also used by mouth for treating conditions associated with polycystic ovary syndrome, including failure to ovulate; high blood pressure; high triglycerides; and high levels of testosterone. It can be argued that inositol’s success in addressing hyperandrogenism is an indication of its usefulness in treating hair loss, and an evidence to corroborate the positive reports of people who have used in this way. Hair loss is known to be especially encouraged by high levels of circulating androgens. Dihydrotestosterone (DHT) synthesized from testosterone is one of the androgens known to trigger the dickkopf-1 gene to produce the protein DKK-1 which is known to cause papilla cell death. Papilla cells are the cells responsible for the nourishment of hair follicles. With increased DKK-1 concentration, hair growth slows down and hair loss accelerates. Therefore, since inositol addresses hyperandrogenism, it follows that it will reduce the body level of androgens, reduce the expression of dickkopf-1 gene and lower the activity of the DKK-1 protein. This chain of events will provide the positive outcome of increased hair growth. Still another possible way inositol reverses hair loss is through its combination with choline. 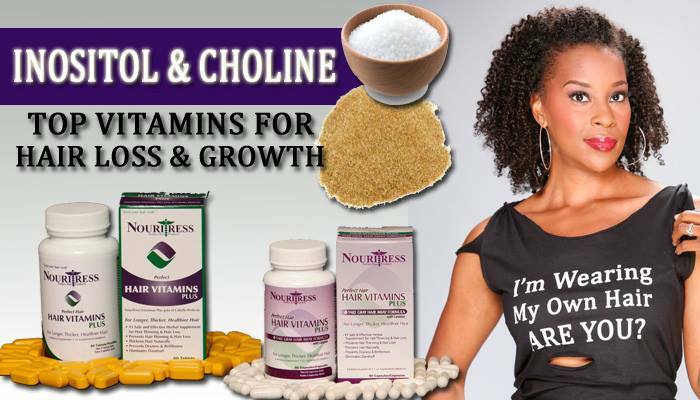 Inositol is often combined with choline bitarate in hair loss remedies. When both compounds are combined, they form phospholipids. Phospholipids are known to be crucial to the development of healthy hair follicles. Inositol’s prospects as an effective hair loss treatment are especially good when you consider that these two pathways demonstrate that it can treat hair loss from the two crucial points: increased growth rate of new hair and the strengthening of hair strands as they grow. The word “HAIR” in the African-American community is so important that many women are developing what we call hair anxiety. Our hair is our glory, our hair is a conversation topic, our hair is a social status, our hair can cause division, our hair can cause arguments, and our hair can stress us out! African-American women are so particular about their hair, but we fail to educate ourselves when it come to our hair. In order to keep our hair healthy we must first understand our hair and what it needs in order to keep it at a healthy state. Perfect Hair Vitamins PLUS contains the ingredient Green Tea! 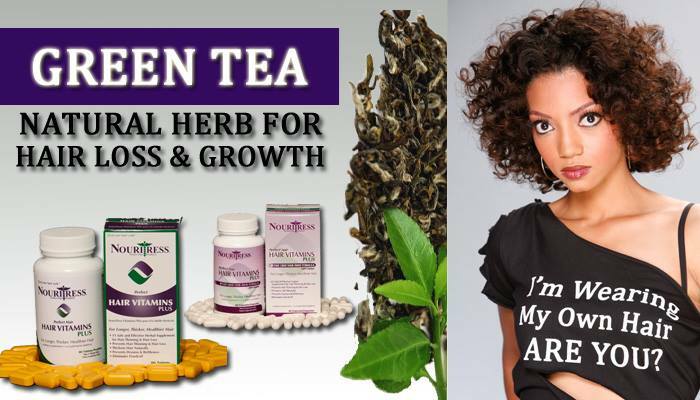 Green Tea, a natural herb has several benefits that helps hair loss & hair growth. Benefits of green tea include the effect of reversing the hair menace as it contains antioxidants. Also, it contains few stimulating effects which are classified as alkaloids. This group of alkaloids contain theobromine, theophylline and caffeine. As per hair experts, a component called epigallocatechin gallate (EGCG) present in green tea helps in preventing hair loss effectively. This amazing antioxidant has been proven to be a potential hair growth stimulant. 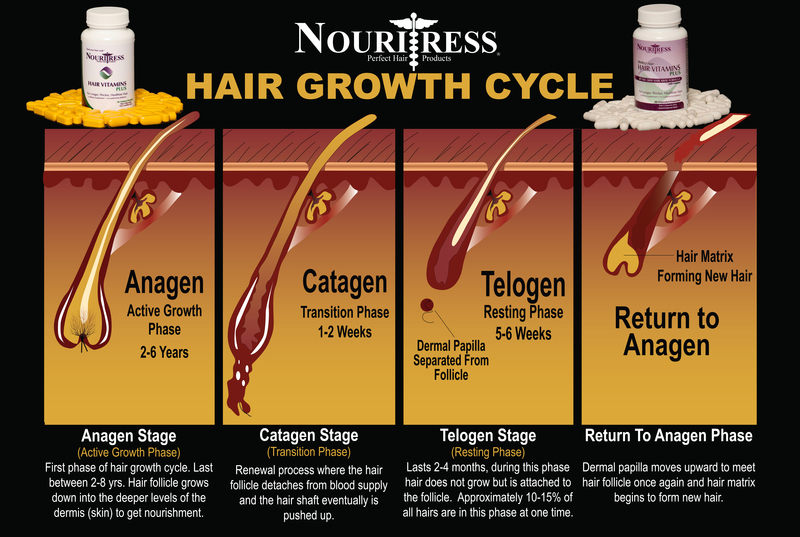 EGCG inhibits the production of Tumor Necrosis Factors (TNF), a molecule which has been identified to cause hair loss. Also, this molecule plays an active role in causing cancer and arthritis. Hence, drinking green tea will not only ensure prevention of hair loss and stimulation of hair growth, but also provide you protection from various other health conditions. Using Green Tea to Control Hair loss? Green tea has recently become a popular drink in the world for its innumerable health and skincare benefits. Unlike in the past when many people did not know the benefits of green tea that control hair loss. Green tea has six benefiting compounds that keep hair problems at bay. It also controls free radicals in the body that damages cell. The main ingredient in green tea is antioxidants, this is the main reason why it is considered healthy for the body as well as skin and hair. Thinning of hair, and loss of unnatural amounts of hair is more common in women. It’s due to the hormonal changes they experience. It’s present in men, too. They call it male pattern baldness, and you can address your hair loss issues with the help of green tea. Green tea contains high amount of antioxidants. It’s believed that the catechins found in green tea have 5-alpha-reductase inhibiting properties. This means that DHT (dihydro testosterone – the substance that causes hair loss in men and women) could be repressed and ultimately hair loss could be avoided. But later on it was discovered that the anti-inflammatory properties in green tea help to stop hair loss and even promote the growth of new hair. Drinking a cup of green tea daily over a prolonged period of time will help lower the hair fall rate and help its regrowth. However, there are also green tea supplements which provide same benefit. Strengthens roots & activates the hair follicles for hair re-growth. Helps destroy the bacterial and fungal parasites in the scalp!